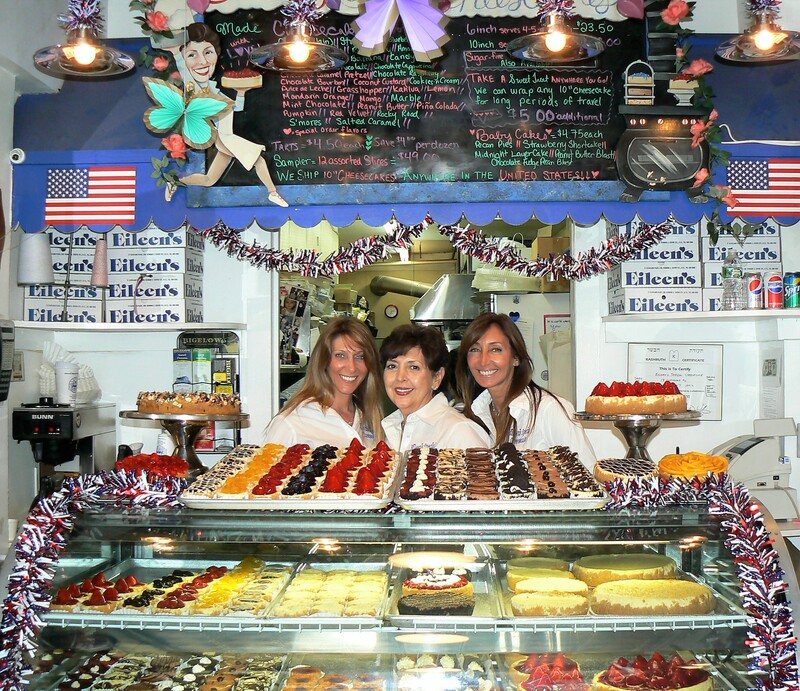 Eileen’s Special Cheesecake opened for business in 1975. I’m in the middle of Eileen’s Special Cheesecake’s kitchen setting up to interview a baker and business owner Eileen Avezzano. The humble sized bakery at 17 Cleveland Place is crowded with cake lovers from every corner of New York and, as it turned out, way beyond. As I’m exploring, I catch a bit of a dialogue. Jay is a long time regular here and a tourist guide as well. “Welcome guys, where are you from?” Eileen warmly welcomed the tourists. I’m ready to start recording the interview, but I can’t help but take a few behind the scene shots. Here, each dessert is masterfully crafted: No shortcuts, no substitutes, no preservatives, no nonsense. Everything is done in a traditional way that’s stood the test of time, and every cheesecake takes between six to eight hours to make. Q: Eileen, how did it all start? A: I always felt comfort in the kitchen with my mom. Cheesecake was something she only made on special occasions because she said it was so much work. My mom passed away at a young age, and I inherited her recipe box. 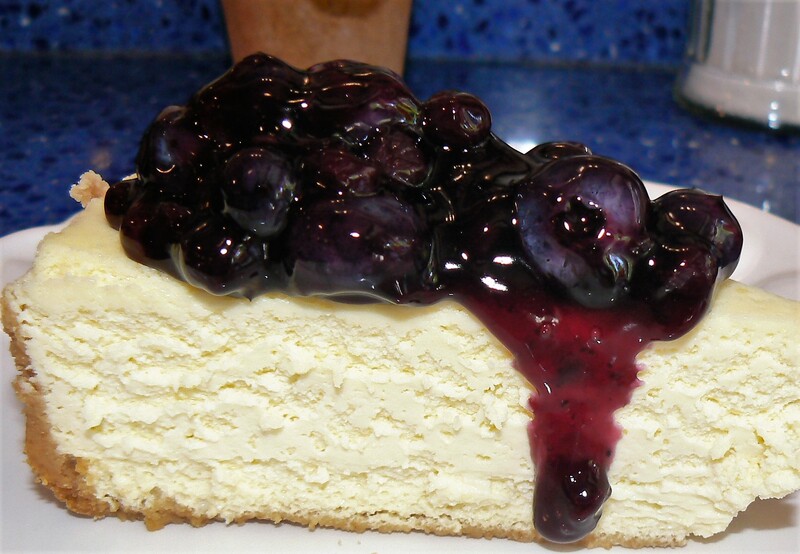 I had never made a cheesecake, but I was always in the kitchen while she was making it. Sometimes she would let me separate the eggs or do little things, but I never did a whole cake by myself. When you are a little girl, things can seem very mysterious. 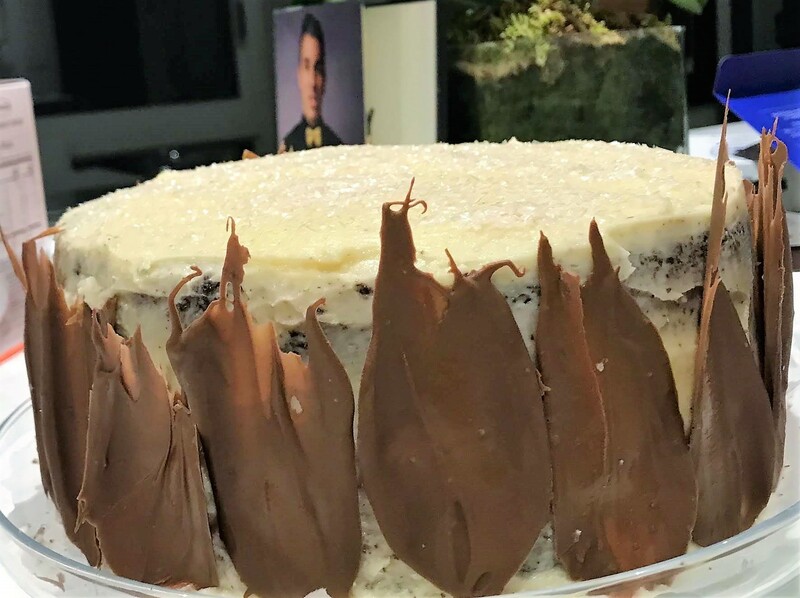 Like, you had to bake it in an oven, then you had to open the oven door for an hour without taking the cake out, and you couldn’t bounce or jump around because the cake might fall, and then the cake had to come out and be put on top of the oven at room temperature, and it was this very mysterious delicious cake. I kind of grew up on special occasions being celebrated with my mom’s cheesecakes. There was a deli in Queens that I used to go to. The owner remembered my name, because his daughter’s name was Eileen. 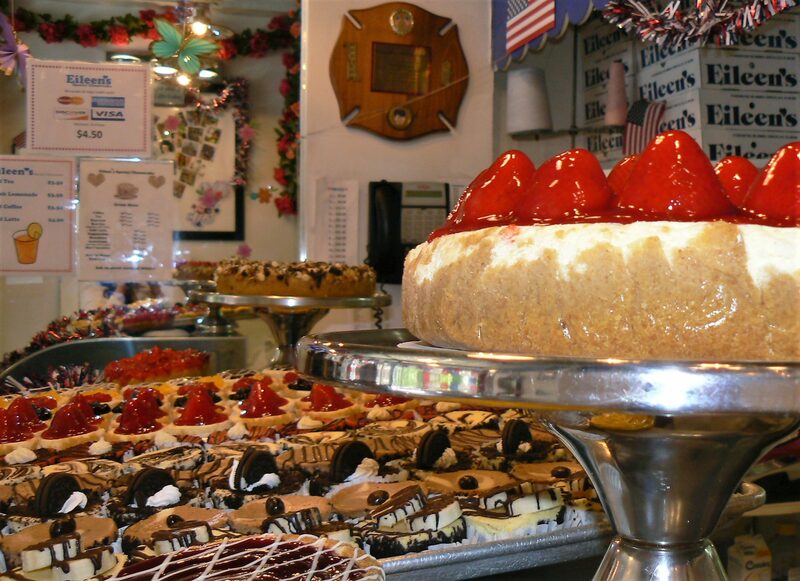 I used to go there every day to buy fresh bread, and one day he said to me, “Eileen, I want you to sample this cheesecake that I just got.” It was one of those big, diner kind of cheesecakes. But when he said the word “cheesecake”, I started to cry, because I had just lost my mom 3 weeks before. My older daughter Bonnie, who was four and my younger daughter Holly, who was in a carriage, started to cry. He took us into his office to just get us out of the way of all the customers. He asked, “What’s the matter?” I said, “Bill, I am so sorry, but I only eat my mom’s cheesecake, and I just lost my mom.” He didn’t know what to do with me and said, “Look, if your mom’s cheesecake was so delicious, will you make me one, and maybe I’ll like it better?” He gave me all the ingredients. I went home that night and after my children were sleeping, it was like my mom was in the kitchen right there with me, and that was when I made my first cheesecake. That’s how I started my business. Q: Did you taste your first cheesecake? A: No! I didn’t taste it. I couldn’t cut it, couldn’t mess it up. I just wanted it to be okay and then I experimented. I was making almost a hundred cheesecakes a week in my apartment, and then I knew I had to take it to the next level. One of Eileen’s team members appears for a second in the door of Eileen’s “office”. (The office is about the size of half a work table, but by Manhattan real estate standards, it’s almost spacious). 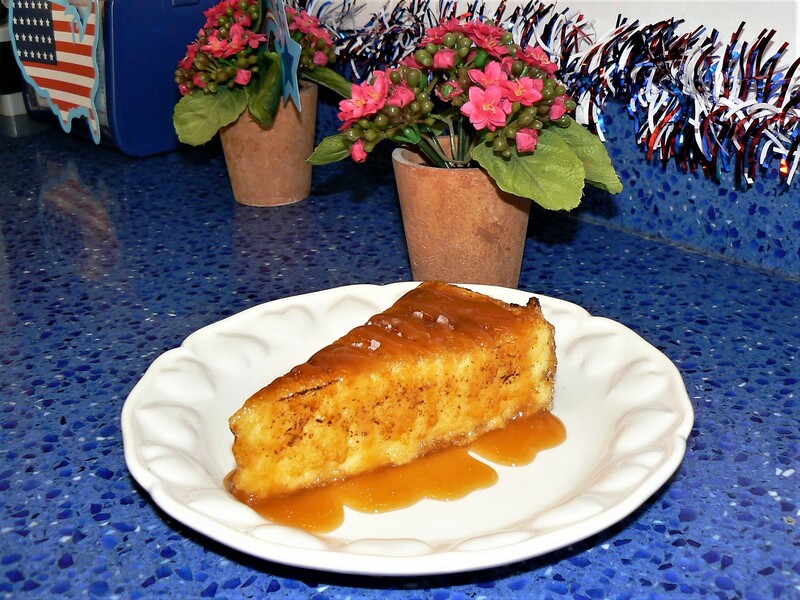 “I just need our forms to ship cheesecakes to New Mexico.” The tourists from New Mexico wanted their family and friends back home to get a taste of Eileen’s genuinely special cheesecakes. Q: It’s a laborious, time consuming and ultimately a more expensive process to make cheesecakes the way it was done 50-60 years ago. Have you tried some “hacks” or taking shortcuts? A: There is no shortcut! We had a fire in an apartment over us and it felt into our kitchen, so I had to rent space in a temporary kitchen. All the other bakers who were renting space in this factory were all watching us separate our eggs, they were surprised and asked why do we do that? They were saying that we could just buy it frozen. So what we did was we separated fresh eggs, looked at the volume of the egg white, and we used the same amount of the frozen egg to see if we would get the same results. The yield was not the same, the lightness was not the same, and we thought the flavor was different. It wasn’t as light and airy as it is when we use fresh eggs. So we just stuck to doing it the old-fashioned way. 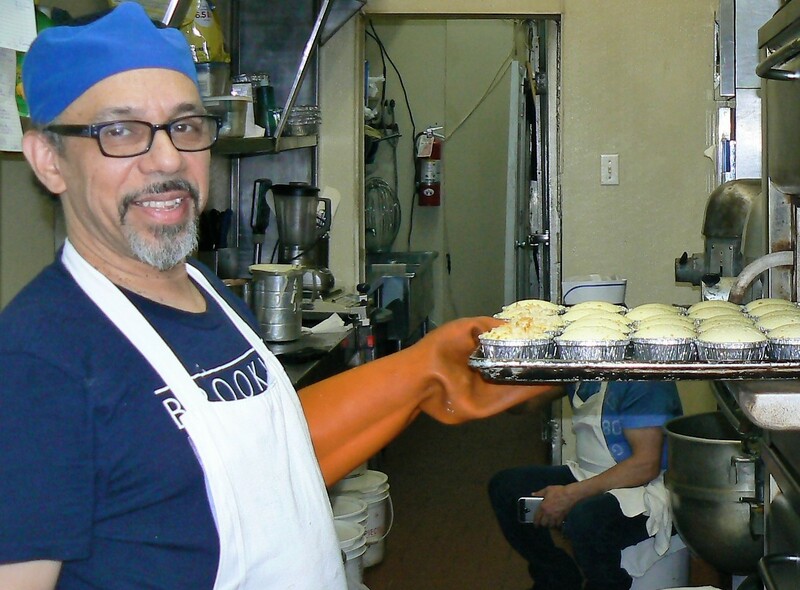 We still separate our eggs by hand and only use fresh cream cheese, there’s no preservatives or additives ever. Q: What did you do to take your business to the next level? A: I found this place. This was truly a ghost town back then, it wasn’t even listed on most maps. Cleveland Place has only about five buildings on the street. The Police Headquarters on Centre Street had vacated, and all the local businesses closed up. There was a pizzeria and it had a gas connection for an oven. So when I was driving around looking for a cheap rent I asked someone in the neighborhood if they knew who owns this building and how I could talk to them. I got a phone number and the landlord really didn’t want to rent it at first, he just wanted to sell the building and I couldn’t buy a building. But then he said, “I’ll give you a chance.” I begged him, saying “Please, I need a place to bake my cakes!” I was with my two little girls, and I think he felt sorry for me and he said okay. This was the cheapest rent you could ever imagine, my rent was $255 a month. That’s how I got started 43 years ago. A birthday cake made from scratch by Eileen’s 11 year old granddaughter, for her mother. Q: Your business has expanded tremendously, and you now ship nationwide. Some say business growth brings more creative freedom, some say they wished they stayed small. How has it been for you? A: It’s a balancing act. When I started my business my children were young, and I used to bring them with me a lot of the times, and on the weekends they were always with me. As the business grows it also becomes even more demanding. You are able to hire help, which takes some of the pressure off, but everything is relative, and everything gets more complicated: Your rent goes up, your payroll goes up, your volume goes up to support all the other things. What I always say is there are ingredients to success just like there are ingredients in a good recipe. I try to tell my employees always keep the principals at Eileen’s Cheesecake of running a happy good business. The ingredients for success are: First, you have to have the product; second, you have to have the passion and third, you must have perseverance. Because if you can’t persevere through the difficult times, then it doesn’t matter if you have a product and a passion. You’ve got to get through it, and the road to success is always under construction, there are always going to be bumps on that road. So if you can persevere, you will come out successful at the end, and I guess that’s why we’re here for almost 44 years. I hope that my daughters Bonnie [Ponte] and Holly [Maloney] will have the same passion and perseverance. I know they have the product, that I have had for these many years, and I hope it will not make them to not enjoy their family life and leisure time, and that they can find a way to do that balancing act in a happy manner. Eileen (center) with her daughters Bonnie (right) and Holly (left). Makes 2 loaves, or 1 large bundt. Combine all ingredients, except apples in a large mixing bowl. Grease and lightly flour a loaf pan, or a bundt pan with a hole in the center. Pour batter half way into the pan and layer sliced apple pieces on top. 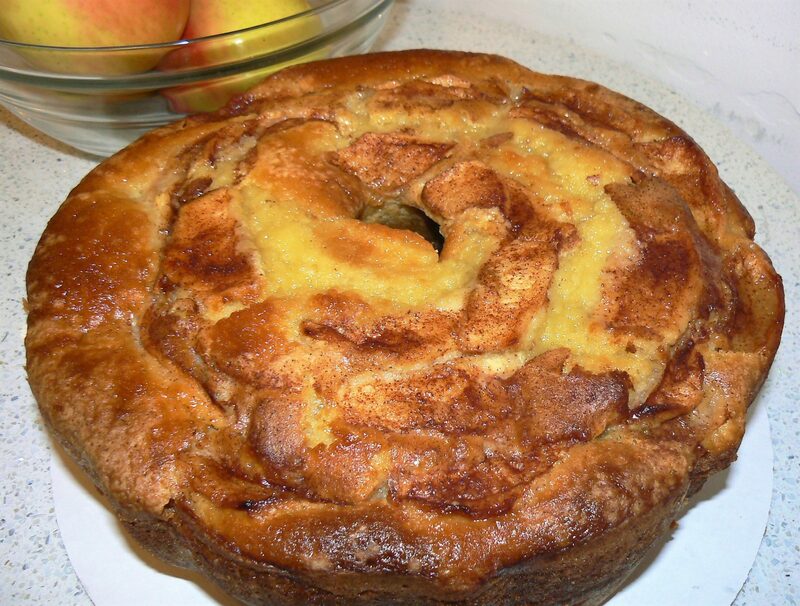 Top with additional batter and another layer of cinnamon apples. Bake for approximately 45 minutes, testing with a toothpick inserted in the center to insure readiness. Let cool for 15 minutes, and remove from pan. 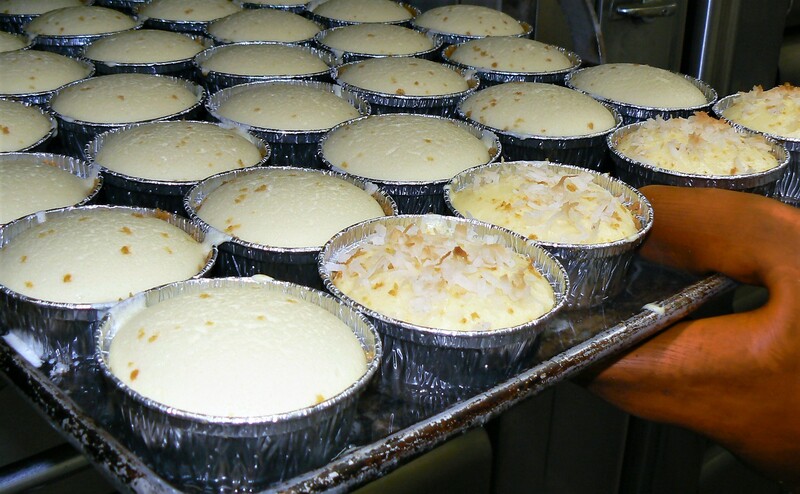 do you ship your cheesecakes??? We’re a media dedicated to covering interesting stories about iconic food places, recipes, and food and travel. We bake cheesecakes and desserts only for articles, our TV show, and web series. 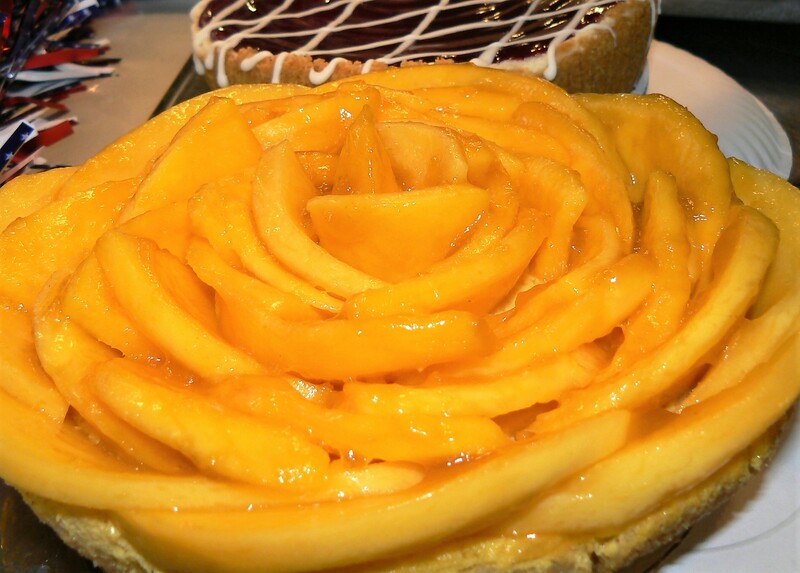 do you ship your cheesecakes or deserts?? I made this cake according to the instructions. I mixed the batter with my electric beater. The batter was so thick that it rose up the beaters onto the bottom of the electric mixer. I baked the cake for 45 min at 350F, and checked it with a toothpick. I had to bake it an additional 10 min. After I let it cool for 25 min., I took it out of the bundt pan and it broke in half. I have baked a lot of cakes before but never without eggs in it. Are the ingredients on this cake recipe correct or maybe it needed eggs or less flour or something. What went wrong? It is indeed an egg-less recipe. I was surprised myself 🙂 This recipe is from Eileen’s grandma. During post-war times, there weren’t as many and as freely available ingredients as there are now. I’ve made it twice, first time with white enriched flour, and second time with wholewheat flour. Both times I followed the ingredients measurements to the letter. The apple cakes came out nicely both times. A bit different texture for the wholewheat one. I baked loaves both times. The batter doesn’t need to be mixed with electric mixer. Simply hand-mixing it with a spatula for about a minute or so will do the trick. Whipping the batter with electric mixer destroys the air pockets in the batter, and might result in a thick, heavy cake dough. Please let me know how it turns out, should you try this recipe again! If you eat the pie freshly made, it’s not going to look like on the photo. The pie will look like that only if you refrigerate it overnight.